Since my venture two weeks ago into the wonderful world of nougat, I have been craving nuts with my chocolate. The squirrels in the hazelnut trees in our back yard have begun their insane, amusing, upside down scramble to get them all before the next squirrel does and before that happens again this year, I am determined to harvest some myself. Suffice to say, I succeeded, got my fair share, and am feeling smarter than your average squirrel. Being one of those lucky folk who have no allergies to any food, I have been toasting up hazelnuts and filling the hot summer afternoon in the kitchen with savoury, toasty smells. 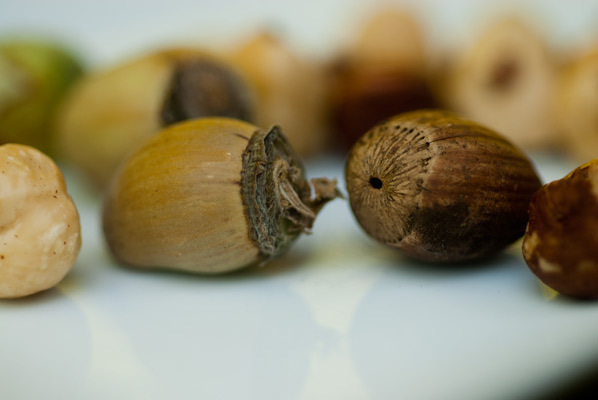 Even the nut haters in our family like the aroma of those back yard beauties. 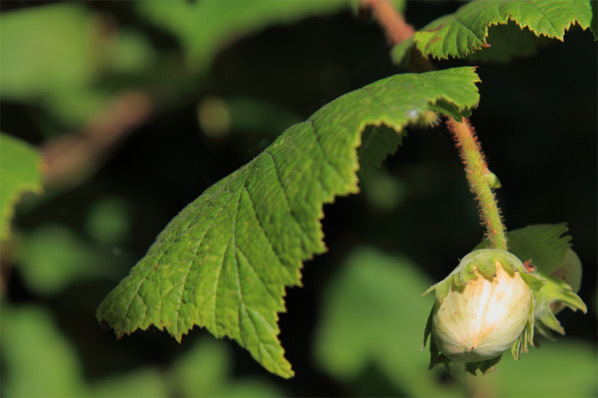 I love also, the other name by which hazelnuts go: the filbert. Now there is a name just made for a character in a play. Brown nougat, as opposed to the glorious, chewy white stuff, is brittle, made from hot sugar syrup and nuts – no egg whites. It is also called praline. This is not the soft, creamy, pecan studded rounds found in New Orleans, although I am very fond of these wonderfully sweet treats (to which my dentist can attest), but closer to the European definition. 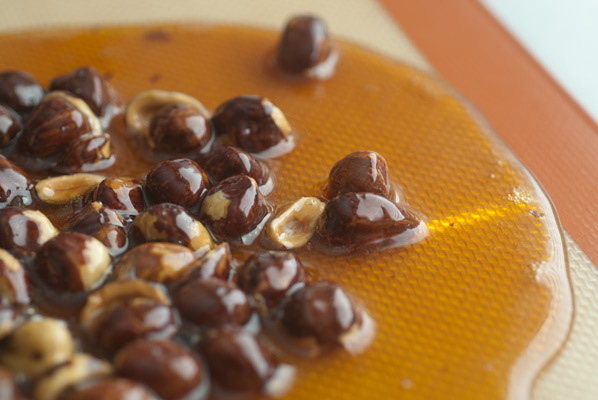 Today, I am going to do a molded milk chocolate, with a dark chocolate/hazelnut praline ganache. 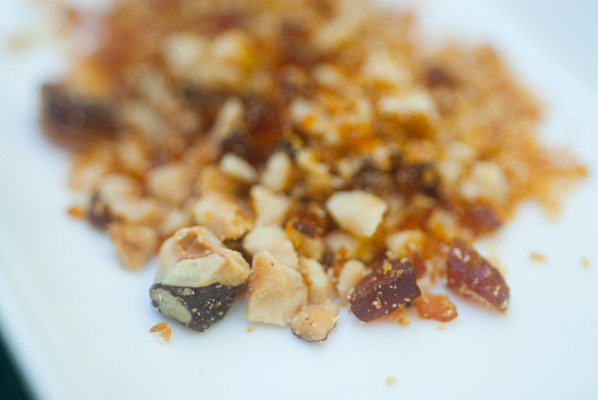 I used approximately 100grams of hazelnuts, toasted for 14 minutes at 350 degrees F, then removed the skins. It is important to do this, as leaving the skins on makes them taste bitter. 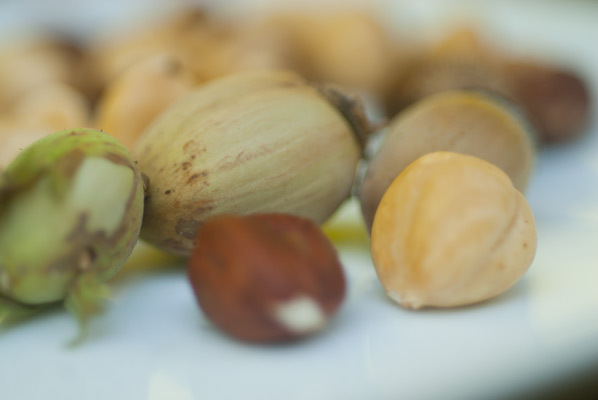 Fortunately, it is great fun to stick the just roasted hazelnuts in a clean tea towel, and rub them vigorously in the towel, back and forth against the counter top and each other, to remove most of the skins. I got a bit distracted while doing this, and had some cascade out the sides of the towel and onto the floor! I doubled the recipe, and instead of caster sugar, used organic cane sugar (I am not slavishly devoted to it, but it worked well). I also poured the cooked mass out onto a Silpat mat, over a marble slab. The hot syrup goes from pale to dark brown very quickly, so do not be tempted to step away from the boiling mass for even a second, as it also sets up quickly once the nuts have been added. I think that is part of its charm. 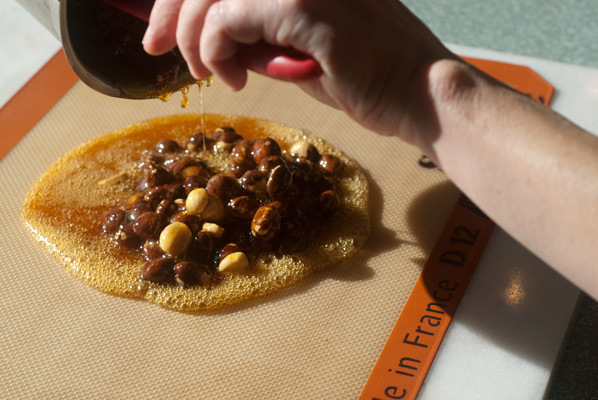 You can have a batch of praline “good to go” for recipes, in under an hour, from start to finish. While the praline was setting, I tempered some milk chocolate, and poured it into my most reliable poly-carbonate mold – the hearts. The clouds had rolled in and the temperature dropped a few degrees, and while I would normally sulk over this, it became the perfect weather for setting the molded chocolate shells. Once they were safely in a breezy corner, barricaded behind some pointy candlesticks so my cats would not be tempted to leap on top of the temptingly high, flat surface, I got to work on the ganache. A few days before, when I picked up whipping cream at our local grocery store, I did a little happy dance, as one brand has upped the butterfat percentage of its cream to 36%, up from 33%, and re-branded itself “Old Fashioned Whipping Cream”. I cannot stand insipid, watery whipping cream, and this whipped up beautifully as an accompaniment to some lovely fresh fruit. I had plenty left over to make a rich and velvety dark chocolate ganache, using 1 cup/250 ml cream to 8 ounces/225 grams dark chocolate. I melted the chocolate in the microwave oven, approximately 70%, so the outline of the pieces is still distinguishable, but they break down when stirred. Heat the cream to a simmer, never a boil. Once I had achieved my lovely silky dark mass of ganache, I had great fun breaking up the brittle, shiny praline and pulverizing it in a food processor, to a chunky powder. I spooned the praline powder into the ganache, not really keeping track of how much went in, I juast wanted a nice “smooth but chunky” look. I let the ganache rest briefly in the refrigerator, while I checked the chocolate heart shells. Using two demi-tasse spoons, I scooped chunks of the soft ganache into the heart centres (kinda like yoga class) and backed them with tempered milk chocolate. 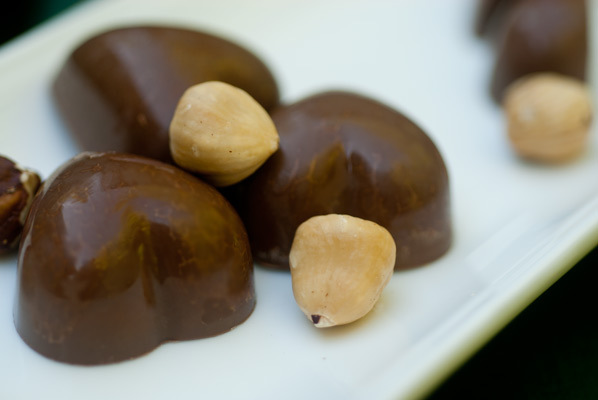 I had decided to use milk chocolate for the shells, because although I adore dark chocolate, I thought it might make the chocolates just a bit bitter tasting, when combined with a dark ganache, and the slightly bitter hazelnuts. I have to say, I am really pleased with how these chocolates turned out. 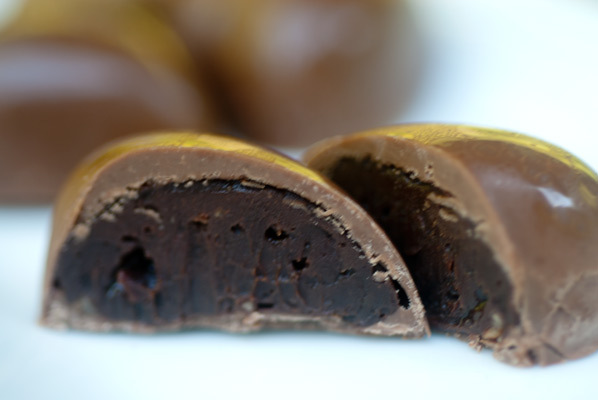 I am not sure, but I suspect that the sugar syrup in the praline bits softened and almost liquefied the ganache (but not unpleasantly), so that the centre is very soft, and the combination of flavours is warm, rich and mellow. A “keeper”, I think. That is, as long as the squirrels and I can come to an understanding about the supply of nuts.